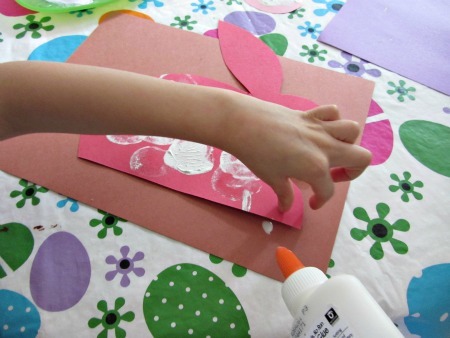 This is an easy, fun Easter bunny craft for kids. We did this at a play date where the ages ranged from 20 months to 8 years old and every kid loved it! 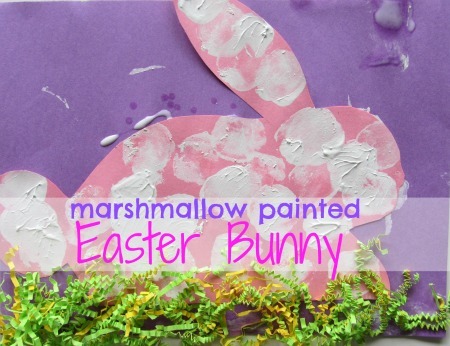 I am going to do a variation of this with an Easter Egg and more paint colors for the Sunday school class I am teaching this week. 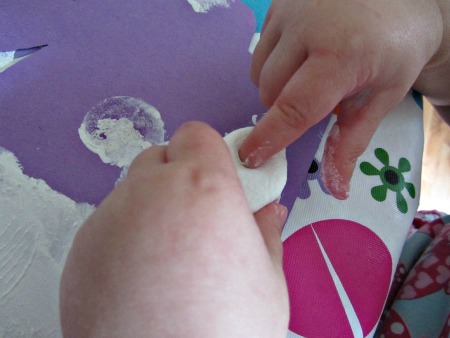 Kids love using silly things like big marshmallows to paint. 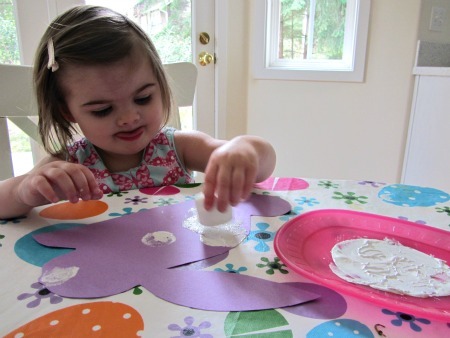 That novelty is a great way to make holiday crafts like these a little more special. Gather your materials. You will need some big marshmallows. 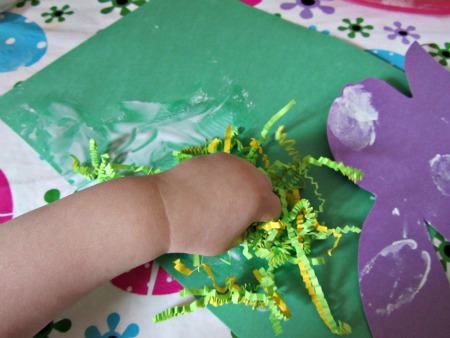 construction paper, scissors, white paint, glue, a plate or two and some Easter grass. 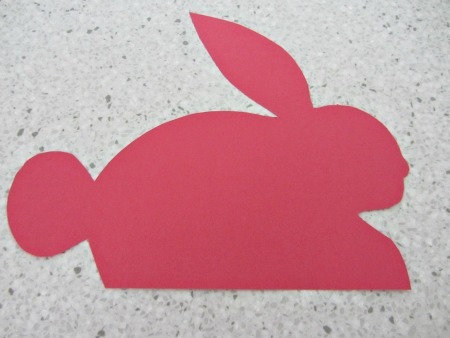 Start by drawing and cutting out an outline of a bunny in a few different colors of construction paper. I let the kids choose the colors. 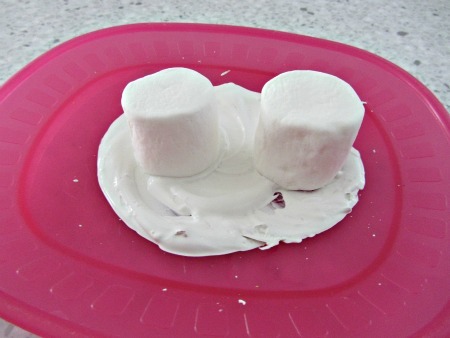 Spread some paint on a plate and pop in the marshmallows. The marshmallows were stamping like crazy! My daughter ( who was the youngest) spent a good amount of time squishing her marshmallow but amazes us all that it never even grazed her mouth. 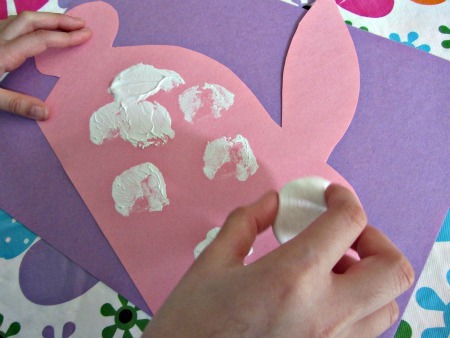 After painting the kids chose another sheet of paper , added glue and popped the bunny on. Then we added a little more glue for the grass at the bottom. 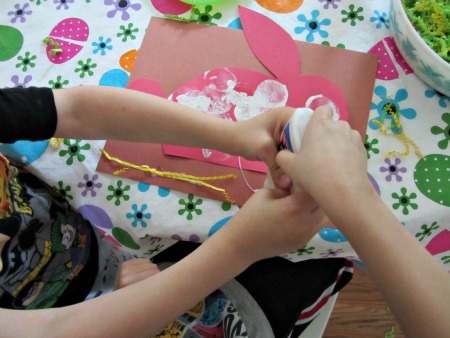 My son and his buddy worked together to get the stubborn glue from the bottle. The kids helped each other throughout this craft time. Both of us moms were taken aback by how we really had nothing to do but take pictures and get a paper towel for one glue spill. My daughter peeled her bunny off a few times and readjusted the grass. 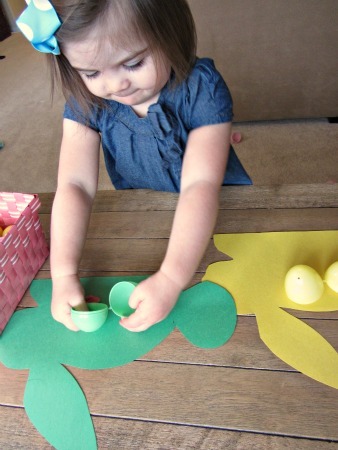 Apparently, she wanted to add the grass then the bunny, once that was understood it was all good. Then we let them dry while the four played. 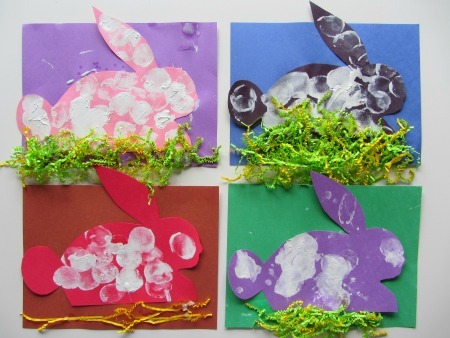 I love how each bunny was unique in this fun Easter bunny craft. After we did this, I had a few bunnies left over. Silly me wasn’t expecting my son or his buddy to want a black or red bunny. We had a few more traditionally colored Easter ones left over. I grabbed them and a few plastic eggs and then, my daughter and I played color match. 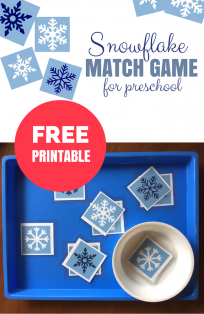 Short little games like these are really the bulk of our Mama directed learning. We spend a few minutes here, a few minutes there with my ideas. Then, the rest of the time, I follow her explorations. She is just starting to learn her colors so small bursts are a perfect way to introduce it. This is too cute! I will definitely be doing this with my 2 y/o in the next couple of days! 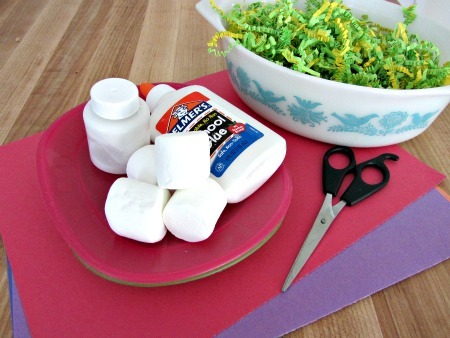 There you go again showcasing a marshmallow craft that looks tempting for me to make. 😉 We could probably avoid the mass consumption of marshmallows with this one because a marshmallow mixed with paint isn’t so tasty. What a wonderful idea! and i’m so excited to try this with my son. Thanks for sharing this to us and job well done! I teach 3 year olds and love this activity. This texture of the marshmallow is a lovely sensory feel.